People who expect quality and personal service call on Brennan's auto body repair specialists. When it comes to repairing your damaged car, you want someone who will do it right - the first time. Since Brennan's collision center is certified by Porsche, Audi, Nissan GT-R and Honda-Acura ProFirst, you're assured of the high standards you deserve no matter what make and model car you drive. For over 30 years, Brennan's has been recommended by Mercedes-Benz and Audi dealers for craftsmanship, attention to detail and turnaround. Our technicians are I-CAR certified, the industry standard, and knowledgeable in all makes and models from luxury editions to family minivans. 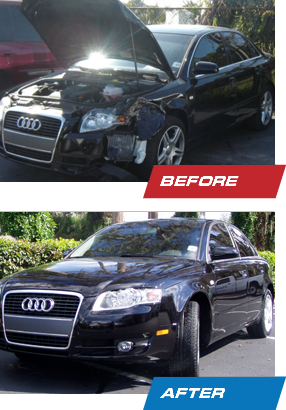 We go beyond just repairing your car. Our service includes those little things that help you get your life back on the road fast - assistance with insurance, transportation, towing, pick-up and delivery. Whether your vehicle suffers a ding or major collision damage, Brennan's is there for you. Give us a call.